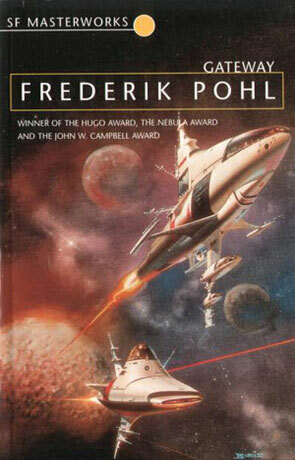 Gateway is a classic science fiction novel by Frederik Pohl. Rereading classics or old favourites is something that I've done all to seldom the last couple of years, which is both a testimony to the high quality of the book published today and the fact that I actually have the money to buy new books. Justly awarded the Hugo Award, the Nebula Award and the John W. Campbell award, Gateway is one of those books that everybody with the tiniest interest in SF should have read and if possible more that once. Bob Broadhead is food miner with no real hope of bettering his situation, until he wins in the lottery. Not winning enough, to live comfortably for the rest of his life on the winnings, he decides to buy an even bigger lottery ticket, namely a ticket to the Gateway space station. You see, a long time ago the mysterious aliens called the Heechee left a lot of spaceships at the Gateway station, ships that may take you to riches beyond your dreams or directly to a not so glamorous death. If you can find your way to Gateway you are free to take a Heechee ship and go – if you have the guts. Which Bob doesn't. But he goes anyway. But that is Frederik Pohl's job to tell you that story, not mine. Pohl lets Bob tell most of the story while visiting his shrink, which gives a lot better insight to Broadheads life, than a straight telling us about the facts as they where happening, could have and this is the real strength of this book. The idea of the Heechee ships and their strange artefacts is very interesting in it self, but Broadhead is the character that makes this book into the stuff awards are awarded to. There are sequels to Gateway (The Heechee Saga), but I haven't read any of them, not because I suspect that there should be anything wrong with them, I just haven't gotten around to them and Gateway stands quite well on it's own. Written on 1st March 2011 by TC.